Over the past several weeks, I have been standing up new hardware in order to expand a cloud infrastructure. During this process, I was tasked with standing up new UCS hardware. I configured the static IP addresses on the N6K devices, configured the firmware to the appropriate versions and created the appropriate service profiles. The next step was to install the base operating systems. With PXE in place, I opened the KVM console from UCSM and waited for the server to power on. Once the server was powered on, I saw the Cisco splash screen as expected. The problem was once the the system posted, only a black screen was seen on the console. It appeared the blade was functioning and no error messages were seen on UCSM, however the screen remained blank 30 minutes later. I attempted to open the console on several other blades and to my surprise they are experienced that same problem. When I plugged a physical KVM directly into the server to check the console, the screen displayed as expected. What was going on? 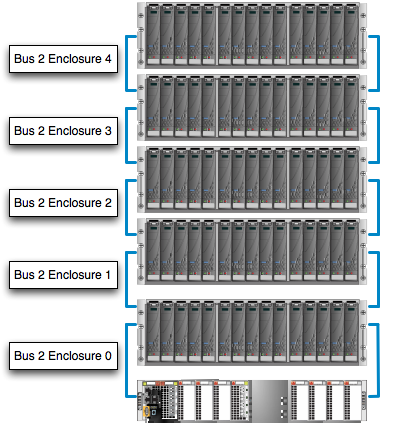 EMC’s best practice for creating storage pools and RAID groups on mid to low end storage arrays (e.g. CLARiiON or VNX) has always been to create them using disks from a single Drive Array Enclosure (DAE). This configuration is sometimes referred to as horizontal striping. You may be wondering why this was the case as a complete DAE failure would result in data unavailablity for all pools/groups on the DAE. As such, you may be tempted to create pools/groups across multiple DAEs, which is sometimes referred to as vertical striping. To understand the reasons you need to first understand the physical configuration of EMC mid to low end storage arrays and then some DAE failure scenarios. vCloud Director (vCD) is a great application for its first iteration and I expect great things from it in the future. Like any application, it has its fair share of issues and if only for my own edification, I figured I would document some issues I have experienced and the resolutions or workaround I have found. As I find more, I will update this post.